On the 21st of January, 1879, a man and his horse were attacked by a Man-Monkey. The Man-Monkey of Ranton is one of favorite stories because it goes back almost two centuries. We found this one in a book published in 1883! This particular story has been referenced by Nick Redfern, but it took some sleuthing to find the source. Which brings us to " Shropshire folk-lore: a sheaf of gleanings". This 600 page volume book contains local folklore on Giants, Devils, Bogies. Fairies. Hidden Treasures, Witchcraft, and Ghosts. You may have noticed there are no chapters on Bigfoot, this particular story is found in the chapter on ghosts. This is because it was commonly accepted that when the dead came back as a ghost they also often took animal form, as stated in the beginning of the ghost chapter, "One mark of this is the constant transformation of the departed into animals." Werewolves were actually categorized as ghosts too. We have been theorizing since 2009 that werewolves are misidentified Bigfoot. Read this great story below and enjoy the following scene from Van Helsing which is very similar to the man-monkey story--except with vampires. A very weird story of an encounter with an animal ghost arose of late years within my own knowledge. On the 21st of January, 1879, a labouring man was employed to take a cart of luggage from Eanton in Staffordshire to Woodcote, beyond Newport, in Shropshire, for the use of a party of visitors who were going from one house to the other. He was late in coming back ; his horse was tired, and could only crawl along at a foot's pace, so that it was ten o'clock at night when he arrived at the place where the highroad crosses the Birmingham and Liverpool Canal. Just before he reached the canal bridge, a strange black creature with great white eyes sprang out of the plantation by the road-side and alighted on his horse's hack. He tried to push it off with his whip, but to his horror the whip went through the Thing, and he dropped it to the ground in his fright. You can read the entire 672 pages of Shropshire folk-lore: a sheaf of gleanings for free online. 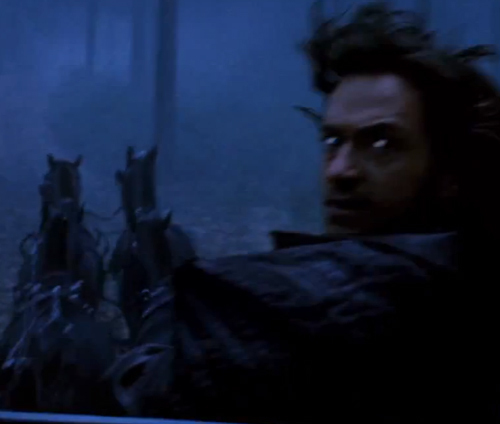 The clip below has a 19th century man, his horse(s), a bridge and an attack from a scary creature. I already forget what the article was about...but can you keep posting random Hugh Jackman clips? Absolutely Jill! We are highly responsive to our fans. Whenever we do a post remotely close to wolverines, superheroes, battling robots and French prisoners(Les Misérables). Hugh Jackman will be there! Bigfoot Lunch Club does not just belong to me, but to the fans too.